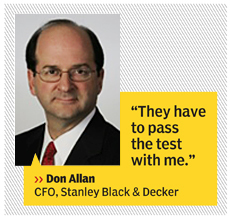 Stanley Black &spamp; Decker has gotten a $60 million direct return over 10 years on its investment in educating high-potential finance staffers. Companies typically look at training programs as a trade-off: employees are not being productive in their real job during the training, but they’re learning skills that will enhance productivity later. But at least one large company, Fortune 500 manufacturer Stanley Black & Decker (SBD), generates a fair-sized monetary return from its annual education program for high-potential finance employees. The toolmaker says that during the past 10 years, it has realized a total gain of $60 million from projects that affect either operating profit or cash flow that the participants choose themselves as part of the Foundations of Financial Excellence (FFX) program. Before the program begins, the participants, who number about 35 each year, must pick a project that’s not part of their regular day-to-day job. Usually that involves doing something related to a different area of the company from where they normally work. Most of the projects are expected to drive at least hundreds of thousands of dollars in financial returns, and for some of them, the impact exceeds $1 million, says SBD finance chief Don Allan. About 80% of the projects are in the areas of productivity and process improvement or working capital management. Participants can also do things that drive top-line growth, reduce fixed assets, or introduce new products or services. About one-third of the participants select projects that provide less financial benefit, in areas such as compliance or internal audit. Allan says he’s now pushing for more top-line-focused projects “that help us grow organically,” in the form of either pricing or volume-related initiatives. The full education program — it started 13 years ago at Stanley Works, which merged with Black & Decker in 2010 — consists of two week-long sessions scheduled four months apart. The first week is largely devoted to education on SBD culture and how the company’s finance function operates. But also during that week, the participants present the ideas for their “commitment projects” directly to Allan. “I review every project from the beginning, and they have to demonstrate to me that it’s outside their normal responsibilities. The first thing they have to do is pass the test with me,” says Allan. For example, he says, somebody from the controller’s organization could work on a project to reduce receivables, even though he or she has nothing to do with receivables day-to-day. “Logistically, it doesn’t always work perfectly, but it forces people outside their comfort zones,” Allan says. Work on the projects takes place during the four months between the week-long sessions. One project that drove more than $1 million worth of receivables benefit was conceived by a U.S.-based employee who observed that in Europe, the company’s average days’ sales outstanding (DSO) was 70. “He had done some research and said he thought he could reduce that by five days,” Allan says. To do that, the employee targeted overdue payments from smaller customers, tweaking their payment terms. He worked, often via videoconference, with the finance and commercial teams in Europe. The work has stretched past the education-program time frame, but by now the European DSO figure is down to 66, and the work continues to further lower it. Allan describes an even-more-lucrative project in which an employee did a deep analysis of SBD’s and competitors’ pricing on electronic security products. She came up with a new pricing structure for some products that resulted in an overall price increase of 1.5% for a business generating roughly $300 million a year in revenue. So the gain was $4.5 million. “This was somebody who wasn’t even from that business team,” Allan says. In another example, an employee helped a $100 million SBD business almost triple the annual efficiency-based cost reductions it had been achieving in its manufacturing operation. For eight weeks, he traveled weekly from company headquarters in Connecticut to the plant in Oregon to work with the business’s president and local operations team, with input from some external consultants he hired. The plant’s existing efficiency initiatives had resulted in annual cost reductions of about 3% per year. With a new production methodology the team designed, that figure is expected to be 8% both this year and next year, after which it probably will naturally sink back to 3%–5%, says Allan. During the second week of the FFX program, usually held in August, participants give 10-minute presentations on their commitment-project results. Each participant grades the others’ presentations, as do other assorted observers. Those include Allan and Tom Conine, founder of TRI Corp., a provider of financial-education services, who helps SBD execute its program. A major aspect of Conine’s role is running a computerized business simulation that takes up most of the program’s final week. The 35 participants are split into teams of 6 or 7. Each team elects such leaders as a president, a CFO, a commercial leader, and a supply-chain head. The teams compete with one another by running hypothetical competitive companies. Each team decides how much product to manufacture, prices the products, projects revenue, and manages various costs. All of the information is fed into TRI’s simulation program, which crunches the data and reveals financials results for each imaginary company’s first quarter of operations. Inevitably, some of the “companies” perform better than others. Adjustments in pricing and cost factors, for example, are then made for the next quarter. During the week, the simulation covers a six-quarter time period. The participants typically put in 12 to 15 hours a day, with Conine pointing out learning takeaways as they’re happening. “It’s quite intense,” says Allan. Besides the results quantified by the simulation program, the teams grade one another’s performances in the simulation, just as they do with the commitment-project information. But how sure is Allan that the computer spits back results that truly reflect the quality of the teams’ decision-making? Still, since the participants are both competing with and rating one another, how objective could one expect their ratings to be? Conine says that over time, he tracks the ratings given by participants and observers, respectively, and that those by the latter are actually slightly lower. He also checks minimum and maximum ratings within each class, as well as standard deviations, to detect any outliers. That’s good, because Allan says there is certainly a career impact from participants’ performance in the project. “In every class, there are one or two people who come out as shining stars, and we tend to push them into higher opportunities at a faster pace,” he says. He can't practice law, but he spent 30 to 40 hours a week for three years learning how to "think like an attorney" — and it was well worth it, he says.